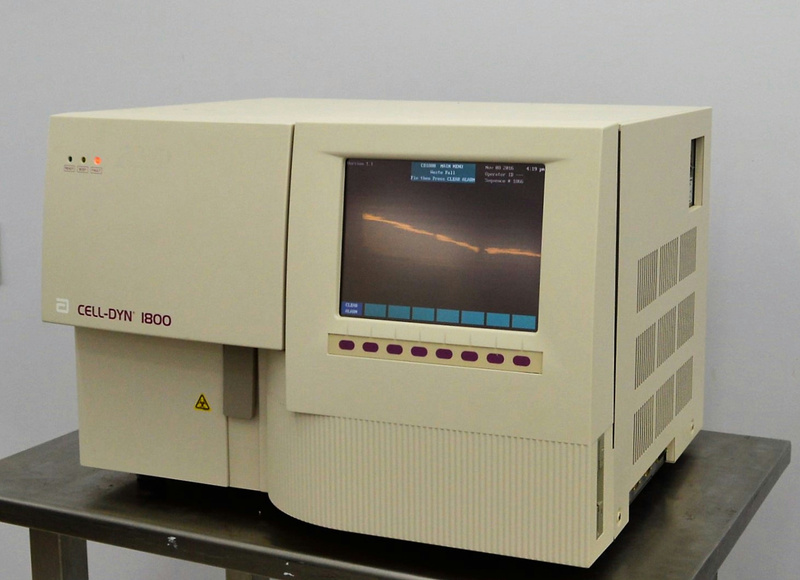 Abbott Cell Dyn 1800 Clinical Diagnostic Benchtop Hematology Analyzer . New Life Scientific, Inc. This used Abbott Cell Dyn is in good cosmetic condition, but does contain paint scuffs and cosmetic damage on the top of the instrument. New Life Scientific technicians evaluated the functionality of the Cell Dyn 1800 and noted that there were errors that needed addressed. There was a pressure-over limit error and they disconnected the sensor which resulted in an low level limit. The technicians corrected this error for testing, but there is no keyboard or waste sensor included with this instrument. NLS does not stock the reagents that would be ideal for testing this hematology analyzer and the technicians cannot determine how precise or accurate the results may be. Unfortunately, there is a waste-full alarm photographed on the LCD readout that stopped the instrument from initializing for photography. The technicians pumped distilled water and air through the instrument, purging the lines. For more information, please contact New Life Scientific or see the links provided. *Please recall that there is a waste-full error and the waste sensor & keyboard will not be provided for this instrument.